Lacson pledged his support for Duterte and his programs on Tuesday even after Senator Antonio Trillanes IV’s remark that only “sycophants and the gullible would appreciate” the President’s state of the nation address (Sona) on Monday. In a text message, Senator Panfilo Lacson said President Duterte remains popular in surveys because he dares to do what his predecessors would avoid doing. “That is probably one of the reasons wht he remains popular in all the surveys. He dares doing what past presidents did not and would not do under any circumstances,” Lacson said. 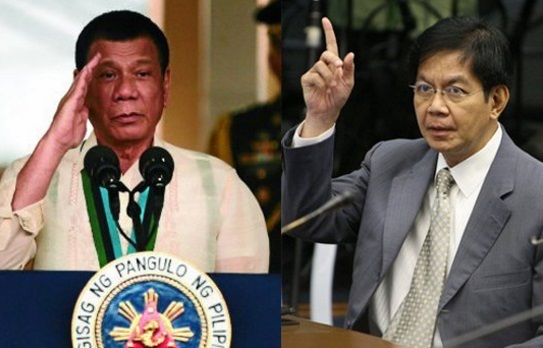 Lacson said he will continue to support Duterte and his programs despite Duterte’s cussing and unstatesmanlike demeanor,” especially if they are for the public good. The Senator said that with President Duterte being different, change is more likely to occur. “In spite of all the cussing and unstatesmanlike demeanor, I will continue to support him and his programs because obviously he is not the more of the same type of leader. Having said that, change is more likely to happen during his term because he is different.” Lacson said.